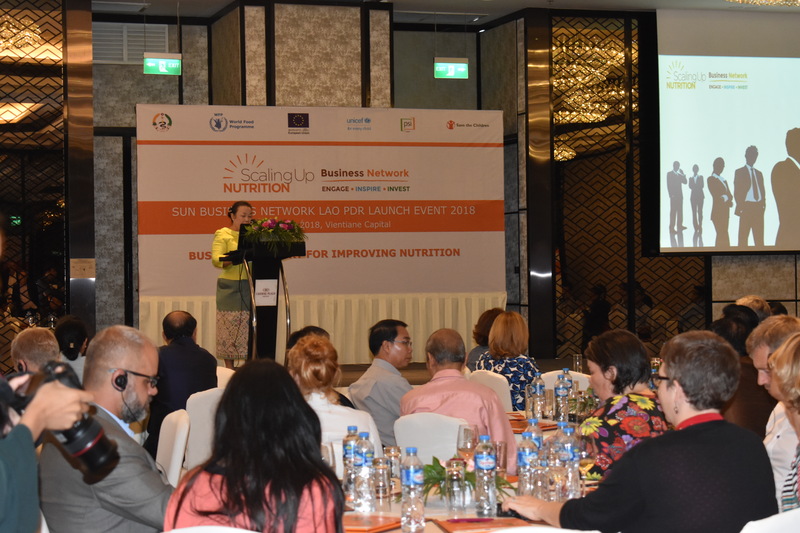 The SUN Business Network (SBN) is part of the global “Scaling Up Nutrition” Network, along with Civil Society, United Nations, Donors and Government. The SBN in Laos is supported by the National Nutrition Committee Secretariat, WFP and European Union, in collaboration with UNICEF, PSI and Save the Children. The Network will establish a unique business platform supporting Lao companies to improve Nutrition and joining the Government efforts to fight malnutrition in Lao PDR, as highlighted in the National Strategy and Plan of Action 2016-2020. ເຄືອຂ່າຍທຸລະກິດ Scaling Up Nutrition (SBN) ແມ່ນສ່ວນໜຶ່ງຂອງເຄືອຂ່າຍ “ ການສ້າງຄວາມເຂັ້ມແຂງດ້ານໂພຊະນາການ” ໃນທົ່ວໂລກ, ຄຽງຄູ່ກັບອົງການຈັດຕັ້ງທາງສັງຄົມ, ອົງການສະຫະປະຊາຊາດ, ຜູ້ໃຫ້ທຶນ ແລະ ພາກລັດຖະບານ. ເຄືອຂ່າຍທຸລະກິດ (SBN) ໃນ ສປປ ລາວ ໄດ້ຮັບການສະໜັບສະໜູນໂດຍ ກອງເລຂາຄະນະກຳມະການແຫ່ງຊາດ ດ້ານໂພຊະນາການ, ອົງການອາຫານໂລກ ແລະ ສະຫະພາບເອີຣົບ ໂດຍການຮ່ວມມືກັບ UNICEF, ອົງການສາກົນບໍລິການປະຊາຊົນ (PSI) ແລະ ອົງການຊ່ວຍເຫຼືອເດັກ (SCI), ເຄືອຂ່າຍຈະສ້າງທຸລະກິດທີ່ມີເອກະລັກໃນການສະໜັບສະໜູນໃຫ້ພາກທຸລະກິດຕ່າງໆໃນ ສປປ ລາວ ເຂົ້າມາມີສ່ວນຮ່ວມໃນການປັບປຸງໂພຊະນາການ ແລະ ຮ່ວມມືກັບລັດຖະບານໃນການແກ້ໄຂໂພຊະນາການໃນ ສປປ ລາວ ດັ່ງທີ່ໄດ້ກ່າວໄວ້ໃນຍຸດທະສາດແຫ່ງຊາດ ແລະ ແຜນການປະຕິບັດງານດ້ານໂພຊະນາການປີ 2016-2020.